At the heart of this anthology lies the world of fashion: a concept that pervades the realm of clothes and dress; appearances and fashionable manners; interior design; ideas and attitudes. Here sixteen papers focus on the Nordic world (Denmark, Norway, Sweden Finland, Iceland, the Faroe Isles and Greenland) within the time frame AD 1500–1850. This was a period of rapid and far-reaching social, political and economic change, from feudal Europe through political revolution, industrialisation, development of international trade, religious upheaval and technological innovation; changes impacting on every aspect of life and reflected in equally rapid and widespread changes in fashion at all levels of society. 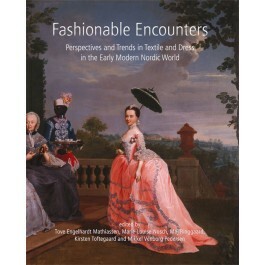 These papers present a broad image of the theme of fashion as a concept and as an empirical manifestation in the Nordic countries in early modernity, exploring a variety of ways in which that world encountered fashionable impressions in clothing and related aspects of material culture from Europe, the Russian Empire, and far beyond. The chapters range from object-based studies to theory-driven analysis. Elite and sophisticated fashions, the importation of luxuries and fashion garments, christening and bridal wear, silk knitted waistcoats, woollen sweaters and the influence of the whaling trade on women’s clothing are some of the diverse topics considered, as well as religious influences on perceptions of luxury and aspects of the garment trade and merchant inventories.